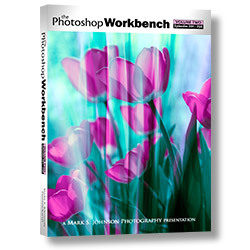 Photoshop Workbench Volume Two features episodes 201 – 250 of Mark Johnson’s world-renowned Photoshop Workbench series. Representing more than 11 hours of inspiring and enlightening Photoshop CS4 and CS5 education, this DVD is an extraordinary value at only $24.95. Mark’s friendly and conversational approach to teaching invites the viewer to explore a non-destructive editing style that encourages joyful and imaginative use of Photoshop. Topics span the gamut from creative to practical, including Spirographic Splendor, Photoshop CS5’s Pixel Bender Plug-In, and Fixing the Hairline Between a Replaced Sky and the Horizon. Each Workbench is presented in its original quality and size (1024 x 768 pixels) and the Table of Contents is keyword searchable. To view the complete Table of Contents and to order, visit www.msjphotography.com. Recently, a reader of my Lightroom 2 book wrote to ask me about how to integrate Topaz DeNoise into an automated Lightroom workflow. DeNoise is a Photoshop plug-in that requires its processing to be done within Photoshop (not Lightroom). You’d set up the Photoshop action first. With a file open, create a new action and give it a meaningful name. Then, while recording the action, launch DeNoise and apply auto settings for noise reduction. (You can set up another action that will allow you to manually adjust, too… I’ll explain this in a bit.) Click OK to apply the DeNoise adjustment. Then, with the action still recording, save and close the file. Then stop recording. If you want to be able to selectively apply manual adjustments during the batch process, all you need to do is activate the Menu option at the DeNoise part of the script. The window will stay open for you to make your manual adjustments, then when you click OK, the Action will resume. Next, create a droplet from the action. Depending on your version of Photoshop, it will be somewhere under the File menu; probably under Scripts or Automate. With the Create Droplet dialog box open, select your new action, and save the droplet to your desktop. You can move it somewhere else if you want, but put it somewhere it can remain. Back in Lightroom, in the Export dialog box, select a sample file and click Export to set up all the criteria for your exported files. I’d recommend you keep them in the same folder as the Originals, enable Add to This Catalog and use TIF as the file format. You can use whatever bit depth and color space you prefer. Finally, make sure to save your new settings as an Export Preset. To process a batch, select all the files you want to run through DeNoise, and export them using that preset. Lightroom will render the files to disk, then one by one open them in Photoshop, run DeNoise, save and close the files. A key point here is that Photoshop can only apply settings to one image at a time. And each image has to be open in a Photoshop document window for it to be processed by Photoshop or DeNoise. That’s what we use actions and droplets for. After Photoshop is done processing and saving your photos, they will be automatically added back into your catalog. I recognize that this is a somewhat compressed explanation; I hope it presents a clear solution. This method is useful for anything you want to automate between Lightroom and Photoshop, especially plug-ins. This year marks the 20th anniversary of the first release of the now-ubiquitous Photoshop. I’m planning a Photoshop workshop with Bret Edge in 2010. We’re very interested to learn the major topics, techniques, tricks etc. that nature and landscape photographers are most interested in, confused about, etc. Please reply here with your thoughts. Thanks! When you do this, the CMYK color space that will be used by Photoshop is determined by what’s set in Color Settings. You should use a CMYK profile that is as close as possible to the color space of the printing press being used; for example, if printing on a web press, use US Web Coated etc.. Try to get a custom profile from the printer, made specifically for their press. If you can’t get one, ask them what CMYK profile to use. I just re-read Bruce Fraser’s excellent explanation of current best practices for digital image sharpening and highly recommend it for anyone needing further explanation of sharpening. After using PSD for many years as the file format for my Master Files (with layers, masks, channels, etc.) I have recently become convinced to switch to TIF for this…. Jeff Schewe and Andrew Rodney make a strong case for TIF in a thread on the Luminous Landscape forum. Over on Lightroom-News, Martin Evenin has posted an interesting article about curves controls in Lightroom and how they differ from the curves in Photoshop. 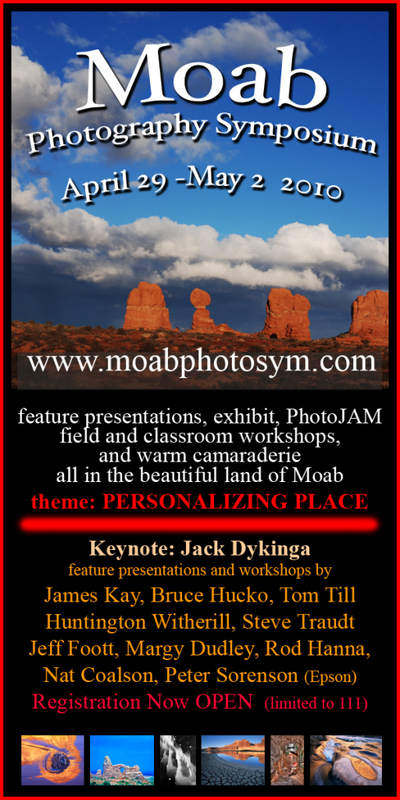 My next Adobe Lightroom class will be held in Denver Sat-Sun Oct 27-28. Presented by the Denver Darkroom. Details Here. 1. When working an image in Lightroom Develop, set the sharpening controls to their default settings by double-clicking the word “Sharpening”. (In all the modules/panels, double clicking the name of the control – not the panel header – will reset them to default values). Note: to fix chromatic aberration, turn sharpening off first. 2. After processing the image for Tone and Color in Develop, TURN SHARPENING OFF IN LIGHTROOM by setting the Amount slider to 0. Then, take the image round-trip into Photoshop for sharpening (and if necessary, selective edits and soft-proofing etc.). To do this most efficiently, use the Edit in Photoshop… command under the Photo menu. 3. In Photoshop, use PhotoKit Sharpener from Pixel Genius to do up to three rounds of sharpening: 1) Capture Sharpen – very gentle, overcomes the loss of sharpness inherent in digitizing an image; 2) Creative Sharpen – can be either global or local; this is the heaviest round of sharpening and is image- and detail-specific; and 3) Output Sharpening – done after all other editing and after resizing image to final print size. 4. You can then take the image round-trip back to Lightroom for printing/presentation etc. or print from Photoshop. Tip: when you’re done editing the file in Photoshop, make sure to use the Save… command and not Save As… This will update the file in the Lightroom database. Every photograph is unique and each image will require different enhancements to make the photograph look its best. However, there are common criteria to use when evaluating your image to determine what enhancements should be made. Many of these decisions are subjective and the choices you make should reflect your creative vision of how the image should look. Some enhancements, such as noise reduction and sharpening, are less subjective as there are established standards of technical quality to be considered. For example: in most cases people would agree that digital noise is undesirable. Also, most people would agree that the main subject of the photo should have sharp, crisp edges. Of course, there are exceptions to every rule and the creative decisions you make should be guided by your personal preferences. When evaluating your image and making creative decisions, start with the biggest changes first and work your way to the smaller “fine-tuning” adjustments. Global edits are changes made to the entire image; Local (or selective) edits are changes made only to specific areas of the image.